See technical specifications for applications for each furnace. 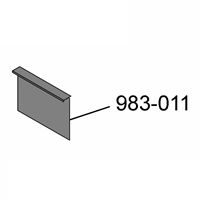 When ordering p/n 809, 7674 or 7594, note how many feet are needed and order accordingly. Chimney Snaplock Clamp, 6", for E-Classic 1450 and Classic Edge 350/550. Should be used as each joint. Chimney Snaplock Clamp, 8", E-Classic (exclude 1450) and Classic models. NOTE: Central Boiler sizes chimneys by their inside diameter. A 6" chimney has a 6" inside diameter and an 8" outside diameter. An 8" chimney has an 8" inside diameter and a 10" outside diameter. A 10" chimney has a 10" inside diameter and a 12" outside diameter. When ordering a chimney part for a Central Boiler furnace, be sure to use the Central Boiler designated chimney size when ordering rather than the actual measurement. For example, when ordering a chimney cap for a Classic 6048, even though the actual outside diameter is 10”, order the 8” chimney cap. If you do not know the proper size for chimney parts, please call first. All returns for incorrectly ordered parts drop shipped from Central Boiler will incur return shipping and a 20% restocking fee. Rope Ring (only), 3/4", 8" I.D. Rope Ring (only), 1.75" Low Density Braid, 6" I.D. Replacement rope ring for chimneys. Rope Ring (only), 3/4", 8" I.D. See technical specifications for applications for each furnace. When ordering p/n 7674 or 7594, note how many feet are needed and order accordingly. Replacement rope ring for chimneys. Rope Ring (only), 1.75" Low Density Braid, 6" I.D. See technical specifications for applications for each furnace. When ordering p/n 7674 or 7594, note how many feet are needed and order accordingly. Replacement chimney slide cover for older model furnaces: CL17, CL40, CL4436, CL5648. Rope Ring (only), 2" Low Density Braid, 8" I.D. Chimney Rain Cap, 6" (see sizing note below), applicable to Central Boiler furnaces: Maxim M250/M255P/M255PE, Classic Edge 350/550 and E-Classic 1450. To be used with Chimney Extension (p/n 6500004). Also consider 6" Chimney Cap (p/n 2900342). Part number 4082 was replaced by this part number. Replacement rope ring for chimneys. See technical specifications for applications for each furnace. When ordering p/n 7674 or 7594, note how many feet are needed and order accordingly. 6" (see sizing note below) replacement chimney tee cover for p/n 6500009. Chimney Rain Cap, 8". To be used with Classic Models. Chimney Rain Cap, 8", E-Classic (exclude 1450), to be used with Chimney Extension (p/n 10508). Replacement chimney slide cover for older model furnaces: CL75, CL7260, Pallet Burner. 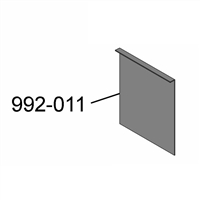 Part number 992-011 is included with kit 4218. Chimney Base Brace Kit, 6"
6" (see sizing note below) Central Boiler Chimney Base Brace Kit used to reinforce the chimney base when three or more chimney sections are used. Attached to the outer casing of a 6" chimney to hold three guy-wires (not included). Recommended for chimneys exceeding the roof by 5' to 13' maximum. This band is for chimney's with an inner dimension of 6" and a outer dimension of 8". NOTE: Central Boiler sizes chimneys by their inside diameter. A 6" chimney has a 6" inside diameter and an 8" outside diameter. An 8" chimney has an 8" inside diameter and a 10" outside diameter. A 10" chimney has a 10" inside diameter and a 12" outside diameter. When ordering a chimney part for a Central Boiler furnace, be sure to use the Central Boiler designated chimney size when ordering rather than the actual measurement. For example, when ordering a chimney cap for a Classic 6048, even though the actual outside diameter is 10”, order the 8” chimney cap. If you do not know the proper size for chimney parts, please call first. All returns for incorrectly ordered parts drop shipped from Central Boiler will incur return shipping and a 20% restocking fee. Chimney Ring, 8" (see sizing note below). This is required for Classic furnaces with the square chimney box (requires welding to the furnace). Chimney Base Brace Kit, 8"
Chimney Guy-Wire Band Kit, 8"
Chimney Tee Restrictor Kit is installed in chimney tee to lower the burn rate. For use only with Classic 4030, 5036 and 6048 models. 8 " (see sizing note below) Chimney Base Brace Kit used to reinforce the chimney base when three or more chimney sections are used. 8 " Chimney Guy-Wire Band Kit used to provide additional stability to chimneys in installations where property damage could occur within the fall zone of the chimney. Guy wire is not included in kit. 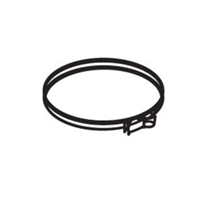 This band is for an 8" inner diameter chimney with an outer diameter of 10". Chimney Band Clamp Kit, 6"
Chimney Band Clamp Kit, 8"
Chimney Attachment Ring, 6"/8", used with electrical conduit (not included) to reinforce chimney when five or more sections are used. For use on an interior or exterior wall, stabilizes chimney while providing clearance from combustible surface. Use of Chimney Attachment Rings at maximum intervals of 8' is recommended. Must be located directly below Chimney Locking Band (6" p/n 6500011; 8" p/n 10509) to reduce stress on the joint. Chimney Band Clamp Kit, 6", reinforces strength between two sections of 6" chimney. Note: 6" band clamps are for the Central Boiler 6" chimney which has an inside diameter of 6" and an outside diameter of 8". Chimney Band Clamp Kit reinforces strength between two sections of 8" chimney. Note: 8" band clamps are for the Central Boiler 8" chimney which has an inside diameter of 8" and an outside diameter of 10". Chimney Support Brace Kit reinforces strength of chimney support when several chimney sections are used. For use only with Classic furnace models 4030, 5036, and 6048. Chimney Support Brace Kit reinforces strength of chimney support when several chimney sections are used. For use only with Classic furnace model 7260 and Pallet Burner. 8" replacement chimney tee cover for p/n 10998. New version chimney cap/spark arrestor provides better fit, features a snaplock clamp and screen that is secured with a clamp-on fastener for easy removal. 6" stainless steel spark arrestor chimney cap for chimney sections used on Maxim 175/250/255 P/255 PE models, E-Classic 1450 models, Classic Edge 350/550 models and Forge 1500/3500 models. 10" (see sizing note below) replacement chimney tee cover for p/n 11605. 8" (see sizing note below) Stainless Steel Spark Arrestor for the new-style chimney (p/n 6500002). Also works with E-Classic chimney section (p/n 10508). Normally installation without the spark arrestor screen is recommended to prevent draft reduction. 8" stainless steel spark arrestor chimney cap for chimney sections used on Classic/Pallet Burner models, E-Classic 1400/2300/2400/3200/3250 models and Classic Edge 750 models.